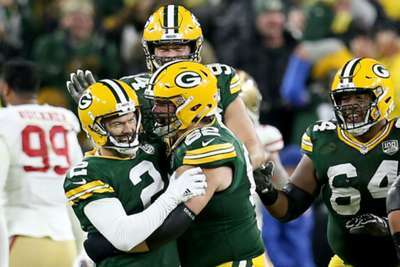 Aaron Rodgers engineered a game-winning drive in the final minute as the Green Bay Packers stunned the San Francisco 49ers 33-30. Packers quarterback Rodgers proved inspirational, paving the way for Mason Crosby to kick the winning field goal on Monday. In a shootout between two struggling teams, a remarkable redemption took place. The Packers hosted the 49ers, who entered Lambeau Field with only one win under their belt and a second-string quarterback turned starter. San Francisco went toe-to-toe with Green Bay, making for another exciting primetime matchup. But, the high-scoring affair did not come down to either play caller. It was a kicker coming off one of the worst weeks in NFL history. Crosby missed four of his five field-goal attempts and an extra point in the Packers' week-five loss. It was a nightmare performance from the 11-year veteran. This week, Crosby turned it all around with a perfect outing that included the 27-yard game winner. Until the fourth quarter, really until the final two minutes, Rodgers' efforts came in spurts. It was not until time was close to expiring that the veteran quarterback showed why he is one of the greatest to play the game. He came into the contest with the highest fourth-quarter quarterback rating since 2008, and would need to pull off yet another comeback win if he wanted to push Green Bay above .500. Like all the greats, he delivered. Rodgers entered the final quarter down a score and the first drive of the final frame was anything but extraordinary. He turned the ball over on downs and then followed it up with a three-and-out after the 49ers recorded their second sack. None of that, however, seemed to faze Rodgers, who put together a four-play, 58-yard touchdown drive to tie the game after the two-minute warning. He then found an unlikely target in Equanimeous St. Brown, whose lone grab for 19 yards extended the game-winning drive. Rodgers finished 25-of-46 passing with 425 yards, his second highest output of the season, and two touchdowns — all while sporting a big, bulky knee brace. It took three quarters for both defensive units to finally show up. The early defensive woes led to a shoot-out between Rodgers and 49ers quarterback C.J. Beathard, who combined for the highest scoring first quarter this season. The success on offense was, of course, due to the two players under center but the defense was not doing anyone any favours, either. In the first half, the 49ers were getting the run around from Rodgers and the Packers looked sloppy trying to contain Beathard. But, both teams made adjustments and big plays when it counted. Green Bay held San Francisco to just two field goals in the second half and the 49ers stopped the best fourth-quarter play caller on multiple occasions. The defensive play of the game, however, went to Packers' cornerback Kevin King, who grabbed an interception during the 49ers' final drive to hand the ball over to Rodgers and eventually Crosby. The Packers understand quarterback woes. It was just last season that Rodgers sat out half the year with an injury. This year, the 49ers' starting quarterback also suffered a season-ending injury. This brought in second-string play caller Beathard. Beathard entered the contest 1-6 as a starter, and under the bright lights at Lambeau all eyes were on the 24-year-old quarterback. Although he did not pull off the win, he showed he can go toe-to-toe with one of the greats. Similar to Chiefs QB Patrick Mahomes during "Sunday Night Football," Beathard used a tough primetime test to show that he is worthy of a spot under center. The second-year QB had his best game to date, completing 69.6 per cent of his passes (16 of 23). He also recorded two touchdowns and an interception.